Lists, lists and more lists. Why are there so many lists online? Could be because thousands of bloggers are following Problogger’s 31 Days to Build a Better Blog. 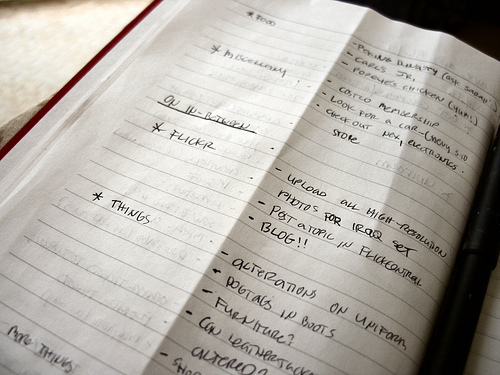 Day 2 was Write a List Day. Or simply because lists work. Having such a great list of lists in the Write a List Post, I scanned through to find posts which help you connect with others. After I turned cross-eyed from staring at the screen too long, here are a few I picked up. 10 Cool Web 2.0 Things You Can do with Your Kids I believe the internet is a great way to connect with your kids. As they grow up and leave the nest, it becomes even more valuable as I have kids scattered across 4 states. I admit it, I’ve never counted. I would not be surprised if there were at least that many lists floating around the internet. Yep I made a list of Twitter WordPress Plugins when I had a hard time finding such. Now they are all over the place. 5 Reason a Pastor Should Blog (and Twitter)This is a unique post, and yes I agree pastors should blog/twitter. 27 Stunning Yet Free Premium WordPress Magazine and News ThemesMany such lists, but as I’m often looking for such, by posting these here, I can find them again and see which ones I prefer. I’m careful using themes I’m not familiar with I saw one the other day that embedded java script in the footer to promote whatever the theme author so desired. 10 of the Best Magazine Style WordPress ThemesMany such lists, but as I’m often looking for such, by posting here I can find it again and see which ones I prefer. 5 Ways to Use Google AnalyticsI decided I like this blogger, one worth following. Because it is something you’ll find me writing about from time to time. I hate dealing with businesses who see their loyal clients as just another number, ignore them while pouring money into gaining new ones. Network with other bloggers, find those with similar interests, share good stuff, and promote each other. Stuff happens. Next Post Next Post: Advice for New Graduates? Wow I’m humbled to be mentioned with all those other great posts. I try not to list too often (maybe a couple times a month) because they tend to promote speed reading and less engagement. I agree they are effective (easy to process), they are rarely as deep as other posts. I know what you mean, lists don’t always leave a lot of room for comment. Now an opinioned post, that is another story. Thank you for the link love – it’s much appreciated! Although it’s not a list, I think you might also enjoy one of my earlier posts, How to Show Appreciation and Respect for Your Clients. So sweet of you to mention my post regarding Web 2.0 Activities to Do with Kids. Thank you. May I say that I love your blog?! The tagline resonates with me. I believe that leaving comments are one way to “create a personal touch in a high tech world”. I appreciated your comments and link. Keep up the great blogging! Love your list of lists. I believe that one reason lists are so popular is because readers enjoy seeing something with a number in it. If you scan magazine articles or books, they frequently say something like: “Seven Great Ways To…,” or “Five foods You Need to Avoid” etc. I guess we’re a society drawn to lists–why, is a mystery. Guess I’ll need to write a list and figure it out!